I'm all moved in and settled in my new apartment! Good thing, too- my job starts one week from today! I haven't baked in my apartment yet- shocking, I know. But I made this Christmas in July cake for my mom a couple weeks ago. Her company sells Christmas cards to non-profit organizations, and July 1st is the start of their sales year. 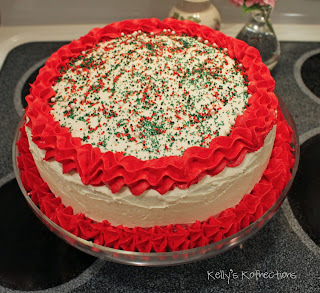 I went with my favorite chocolate cake recipe and my go-to vanilla buttercream. The cake itself isn't difficult, but I broke a few of my cardinal baking rules, which made everything infinitely harder. 1. NEVER double a batter recipe, especially if you don't know for sure that you have a container big enough to handle everything. Broken rule outcome: Stress. And having to divide the batter just to stir it. And lots of mess. 2. NEVER start a cake late at night. Broken rule outcome: Kelly up til 4 AM because her impaired judgment messed up the cake and her OCD wouldn't let her leave it less than perfect. 3. KNOW what you'll be storing the cake in before you start. Broken rule outcome: I decorated the bottom edges of the cake, forgetting the dome lid was gonna need somewhere to sit. 4. USE Baker's Joy. I hardly ever use parchment paper for cakes, because they usually fail. Broken rule outcome: The parchment paper failed. Fortunately, I had a third layer of cake available. After realizing my mistake about the bottom border (it being around 2 AM), I panicked. I tried to wipe the border away, but it looked horrible, so I smoothed it out, which looked worse. I resolved to make a third batch of buttercream. My parents were asleep at this point, so I went into the laundry room, sat on the floor, and mixed it up. Then, I scraped away all the bottom part (white and red) and started again. The end result was very pretty, in my opinion. I only wish I'd listened to my own rules! 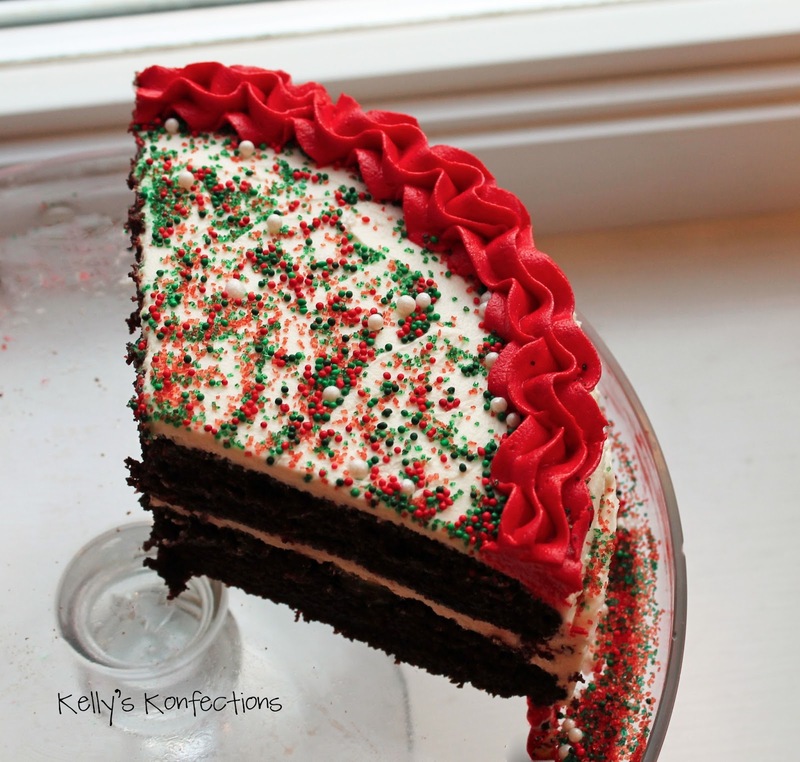 Yield: One 2-layer 9-inch cake. 1. Sift all dry ingredients into the bowl of an electric mixer (paddle attachment). 2. Add buttermilk, coffee, canola oil, eggs and vanilla, and beat for 2 minutes on medium speed. 3. Pour batter into two 9 inch round cake pans that have been liberally sprayed with Baker's Joy. Bake for 20 minutes at 350 degrees, then rotate pans. Bake until the tester comes out with just a few crumbs, ~30 minutes total. Be careful not to overbake! 4. Cool on racks for 20 minutes, then gently turn them out of the pans onto the racks to cool completely. 1. Beat butter in the bowl of an electric mixer with the paddle attachment until light and fluffy, ~3 minutes. 2. Add powdered sugar one cup at a time, beating until well incorporated. 3. Add vanilla extract, milk and salt, and beat to combine. 4. Switch to whisk attachment and beat for ~2 minutes to fluff it up.